Before he got into the picture in the entertainment industry, Aboloro Akande(a.k.a 9ice) was just another jolly good fellow trying his hands on music but with the coming of his monster hit track, Gongo Aso, he became a changed person in all ramifications. In this interview with AHAOMA KANU after he received the award as National Daily's Most Outstanding Artiste of 2008, he reveals how his life was changed since he released his last album as well as informed his fans on what he has in stock for them this year. 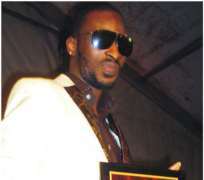 9ice, congratulations on your award as National Daily's Most Outstanding Artiste of 2008, how did you receive the news? I felt great because it has been a continuous thing throughout 2008 and I feel happy that people are appreciating what I am doing. When you are encouraged you tend to do more. I appreciate National Daily for the honour they have done me. It is indeed a great honour for me. Your last album got a great deal of honours your way; did you envisage that the project will take you this far? No. It's like when you plan for a journey of 10 years and all your expectations within the time set for the achievements and then it starts happening before you even get started. I never foresaw all these feats that I have achieved and I will say that I am a very lucky person. When it started happening, what was going on in your mind? It was shocking and I must tell you that I am still in shock; I am still to come out of that feeling. You won almost all the awards in the categories of award events you were nominated, how do you feel being so honoured? To a lot of people, the feeling will be that of being on top of the world but to me personally, I feel that I am the most favoured. You promised in your track, Street Credibility that you will bring the Grammy, when will this promise be fulfilled? I promised a lot of things before and by the grace of God I delivered; I promised that my music video will be shown on MTV Base and it did happen; I also said so of it being shown on Channel O and it happened and I did not put a time frame on those promises. Most of the time I don't specify when the promise will be realized, I just allow God to do it at his own time. Your songs are played in far away places which shows its acceptability, can you tell us exactly how many copies of the album that have been sold? If I am to be honest with you I will put the figure at a minimum of five million but if you ask the marketers they will not come out with a number because our industry is structured in a way that it would be difficult to find the exact figure. How has all the awards you have been winning affected you? It has affected me a lot in terms of where I have gone and is still going; in terms of my personality, how I dress and how I speak and how I relate with people especially the doors it has opened for me. What are those things you did before as a regular guy from Alogomeji that you can't do now with your present status? Well I will say that I can't dress anyhow now; my mood depicts what I wear. How do you manage this sudden fame, money and publicity that seemed to have come your way since you released your single, Gongo Aso as it can be seen that you have been able to stay away from the tabloids except for once when you had a brush with the police sometime ago? There is what we call home training and it depends on how you were brought up in your family and again where you are coming from. Maybe if probably I feel on top of the world I would have been behaving differently from how I behave now. I still believe that I have a lot of things to do and this is just the beginning so I don't need to start misbehaving now, my eyes are on the goals. So many things happened to you last year, which will you pick out as the best among all? The best thing I will say that happened to me last year was when my son was being giving birth to on December 4th; that is my most cherished moment last year. I was in France and was very happy. Now that you have gotten international awards, will you be doing collaborations with international artistes? We have started working on it and by the grace of God it will soon become reality. We have intention of having Akon, Little Wayne and Wyclef on my next album and also Asa. What do you have for your fans this year? I will tell them that this is 2009ice and I believe more credible things are in stock and will be unfolded within the next few months. With the level you got to with your last album, how confident are you about your next album? I know that expectations are great right now and we know people expect something even better, we are trying everything possible to make it better but then it is not man that wills but God so we will do our best and allow God do the rest.